UNSW Eastern Suburbs Bulldogs vs. Manly Warringah Wolves – Henson Park on Saturday, July 14, 2018. With four rounds to go before the finals, the race for positions in the top five is extremely tight. The North Shore Bombers have a virtually unbeatable lead for the minor premiership, but between second and sixth is a very tight race, where no-one is guaranteed even to make the finals, let alone the double chance. In the last few rounds there’ll be a few teams looking over their shoulder to see what’s happening with other results and how it affects them. Not just the winners, but the margins. The percentage splits depend on it. All games in Round 14 were played on Saturday afternoon, in sunny but chilly conditions. There’s often grounds that have been reduced to quagmire status by this time of year, but not this season. Grounds were in good shape, and the football played throws up plenty of questions about how the final ladder will unfold. Henson Park was the venue for the clash between the UNSW Eastern Suburbs Bulldogs and Manly Warringah Wolves. Going into the game, it was third v second, and in such a tight race for positions in the finals, this game was always going to be especially valuable for the two teams. Not just for the four points the winner would get, but for the lost points that the loser would not. Manly Warringah have only won one game away from Weldon this season, but the Wolves gave themselves every chance to double that record as they burst out of the blocks with an impressive first quarter. With their big name players firing, they were getting plenty of drive out of the centre and propelling the ball into their forward 50 with regularity. The scoreboard would be a reflection of Manly Warringah’s early superiority, with the Wolves adding four goals to two to lead by 11 points at quarter time. With so much on the line, UNSW Eastern Suburbs had to lift in the second quarter, and they applied themselves diligently to the task in the second term. It wasn’t easy to keep the Manly Warringah guns quiet, but they had some success in that department, and gradually began to work their way back into the contest. With three goals to two for the quarter, UNSW Eastern Suburbs cut the Manly Warringah lead to five points at half time. It was an arm-wrestle in the third quarter, with two desperate sides vying for supremacy. At times the game looked to be drifting along, waiting for the moments of individual brilliance that would break it open. But the defences were tight and no such chances were forthcoming. But the Wolves struck late in the quarter, and by winning the term of footy by three goals to two, put the lead out to 13 points at the last change. Manly Warringah were in front, but the game was up for grabs. It was there for the team who would step up, seize the day, and get the job done. And that team would be the Bulldogs. As soon as the ball went in the air to start the last quarter, it was clear that UNSW Eastern Suburbs were the more desperate side. The momentum swung their way, and the tide quickly turned. It was the quarter that the Bulldog diehards were waiting for, as the deficit was wiped away and turned into a lead. Seven times would twin flags be brought up for UNSW Eastern Suburbs goals, while Manly Warringah would achieve just two major scores. 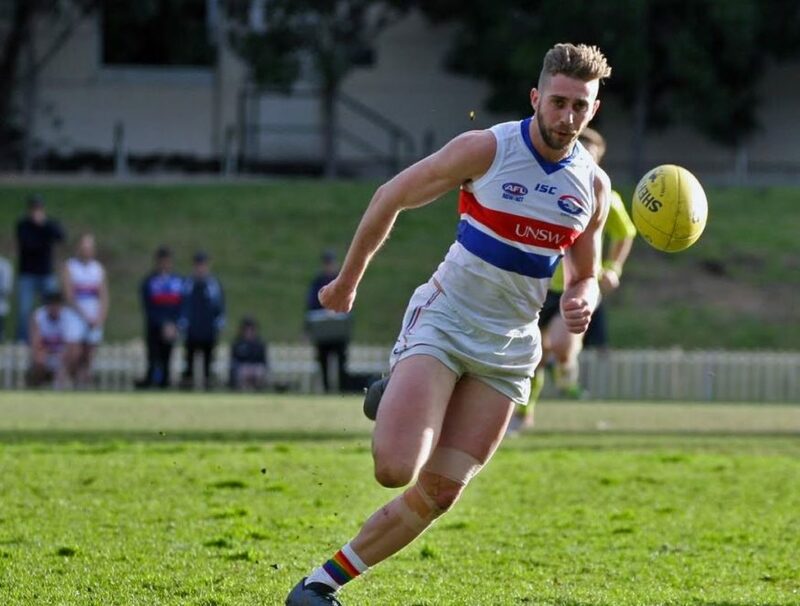 UNSW Eastern Suburbs players who had been quiet for three quarters stood and delivered when it mattered, in a quarter of vintage Bulldog footy. In the end, UNSW Eastern Suburbs Bulldogs took the game by 11 points. James Pascoe contributed four goals in a best-on-ground performance, while Justin Cann and Jack Blair also featured prominently. The Bulldogs are in third place, behind the East Coast Eagles by the most minute percentage buffer. If UNSW Eastern Suburbs had scored one more point in any game this season, they would have been second. With games to come against the Camden Cats, Western Suburbs Magpies, East Coast Eagles and Pennant Hills Demons, they need to use their next couple of games to build some momentum in the approach to the finals. Connor Pettersson scored four goals for Manly Warringah, while Harrison Koch, Lachlan Behagg and Jack Hawkins picked up plenty of the ball for the Wolves. But after leading at every change, this was a game that got away. Manly Warringah drop from second to fifth, but there’s still plenty of time for their season to rise or fall. Their last four games are against St George Dragons, Sydney University, Western Suburbs Magpies and the UTS Bats to come, and importantly home ground advantage for the first two. With no games having been postponed, Premier Division takes a break next week. For the teams from second to sixth being separated by so little, it’s the last chance to fine-tune the game plan and get the players fit and firing. When the competition returns in two weeks, it’ll be a mad dash to the finish line. MANLY WARRINGAH WOLVES BEST – H Koch, L Behagg, J Hawkins, J Field, C Pettersson, L Kilpatrick.